This is a healthy breakfast recipe that will not only keep you fuller for longer but will also keep that heart health in top shape from nutritionist, Lucy Hyland. She has added the natural heart friendly oils from whole nuts and seeds and blended with our heart friendly Camelina oil. Place the oats, Camelina oil, cinnamon and maple syrup in a large bowl. Mix really well with your hands and ensure the oats are completely covered. Place the oats in a large frying pan and put on a low heat on the hob. Gently toast the oats for about 10 minutes, constantly shaking the pan or stirring well with a spoon. Add the nuts, seeds and dessicated coconut and toast for another 5 minutes. Serve with chopped fruit and a good dollop of yogurt. 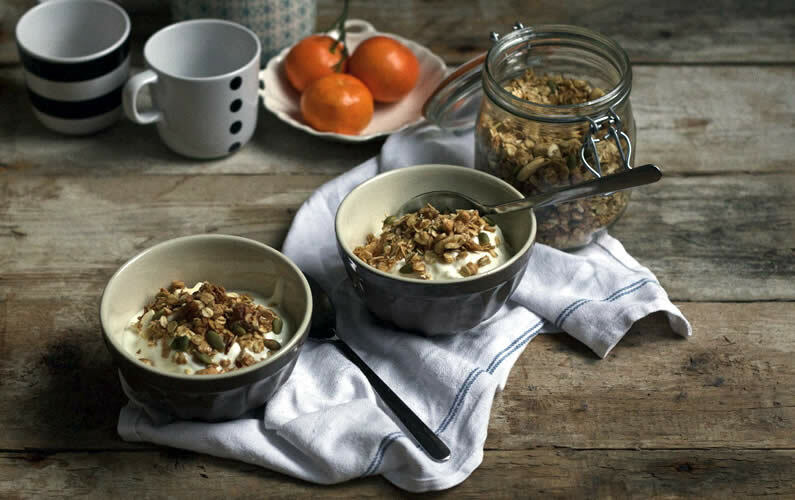 This lovely toasted oats recipe will serve you for 4 days and keeps well in a sealed container in a dark cupboard. We cook our oils for the minimum time possible, and always on a low heat. This maintains their health promoting properties and protects their delicate oils.